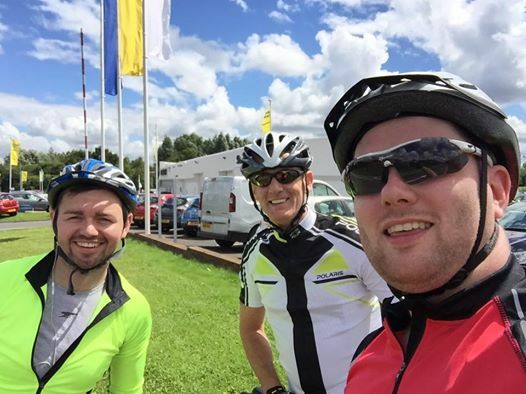 On Sunday 31st July Andrew Mason, along with 2 friends, Martin Dolan and Paul Moffatt, took part in a 50 mile cycle from Wigan to Southport, and back, to raise funds. Andrew has been a long time supporter of the Ally Cadence Trust and we are extremely grateful for the support that we receive. 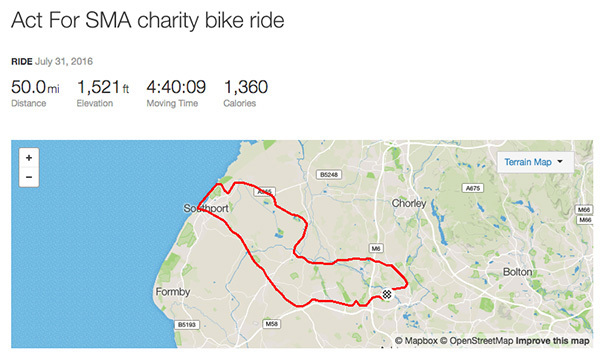 Following the event Andrew posted "50 mile round trip from Wigan to Southport and back to Wigan was a kiler but glad we've done it. Great laughs and scenery was just a bonus. The real reason was to raise awareness and money for ACT for SMA and as it stands money raised is a massive £580 with more from gift aid. A massive thank you to Martin Baz Dolan and Paul Moffatt for doing this ride with me, and to everyone that donated ☺️"
If you would like to donate please take a look at Andrew's Justgiving page.